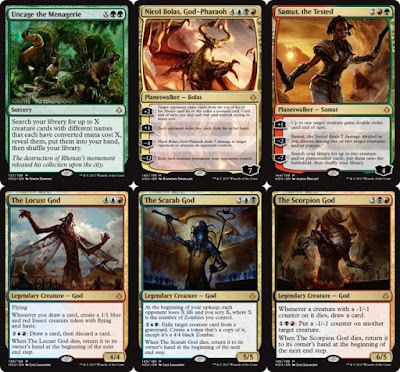 This evening during the Friday Night Magic event at your local gaming store, we are fairly certain Magic: the Gathering players will be talking about the remaining Hour of Devastation cards posted today by Wizards of the Coast. We know we'll be yattering about this at our local shop, OMG! Games here in Barrie. 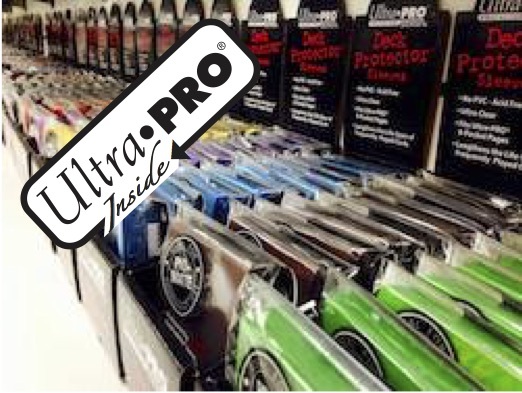 There was a metric ton of cards previewed today, mostly uncommon and common, and there is quite a bit to review over the next few weeks. For today however, here at MTG Realm, we are just giving you the summary. The WotC official Hour of Devastation Card Image may be found at this link, and the Release Notes for the set may be found over here. The Planeswalker decks for this set contain 10 additional cards which are considered part of the Hour of Devastation set. 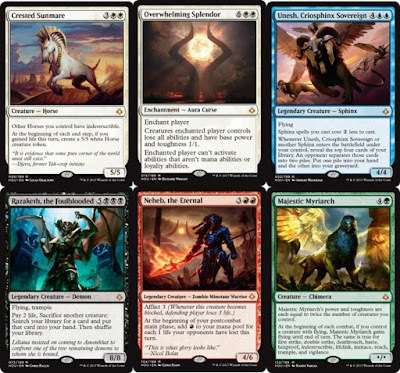 These two products have 2 mythic planeswalkers, 2 rares, 2 uncommons, 2 commons and 2 common dual taplands. There are five full art basic lands different from the previous Amonkhet set, which highlight the arrival of Nicol Bolas. A static ability with a variable value. Whenever a creature with this ability becomes blocked, defending player loses life equal to the Afflict value. Keyword ability which is an evolved Embalm. 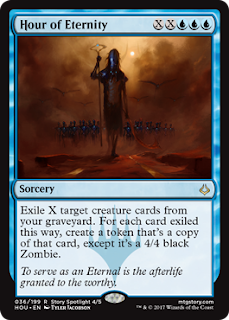 Eternalize can only be activated if the creature is in the graveyard. When activated, the card is exiled and creates a token copy of itself. 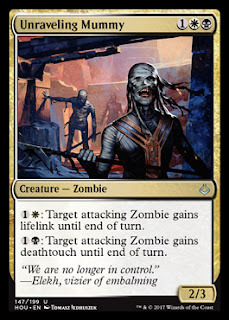 This creature token is a copy of the eternalized creature, except that it is a zombie in addition to its other creature types and monocolored black. Its power/toughness becomes 4/4. 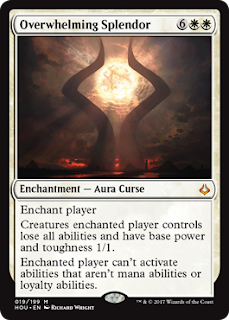 Many creatures with eternalize have abilities that get better because of their increased power. While the Scorpion God hunts down each god one by one, the Locust God unleashes a deadly swarm, devouring the magical Hekma barrier protecting Naktamun. Hapatra, Vizier of Poisons, refuses to sit by while her city falls. 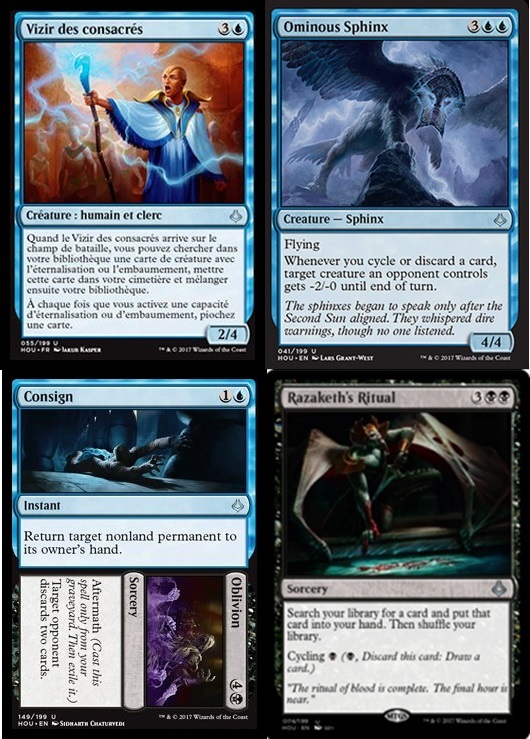 Shuffle your library, then exile the top four cards. 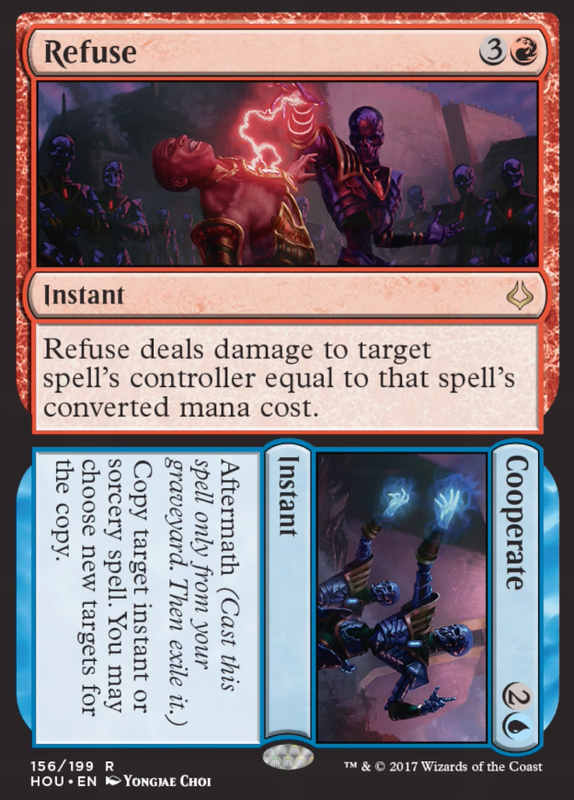 You may cast any number of nonland cards with converted mana cost 5 or less from among them withou paying their mana coasts. 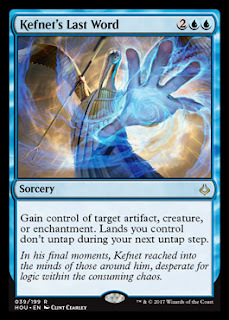 Lands you control don't untap during your next untap step. 2B, Discard a card: Merciless Eternal gets +2/+2 until end of turn. Whenever you cycle or discard a card, target creature an opponent contols gets -2/-0 until end of turn. When Vizier of the Anointed enters the battlefield, search your library for a card with Embalm or Eternalize, put it into your graveyard, then shuffle your library. Whenever you Eternalize or Embalm, draw a card. Search your library for a card and put it into your hand. Shuffle your library. Tap: Add C to your mana pool. 2, tap: Exile target creature you control. 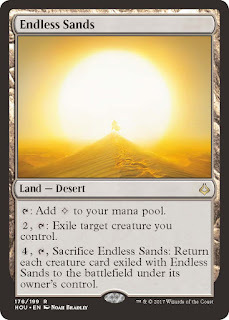 4, tap, Sacrifice Endless Sands: Return each creature exiled with Endless Sands to the battlefield under its owner's control. Sweet art from the brilliantly talented Noah Bradley. If Helvault coupled with Safe Haven and had a kid, this card would be it. Ceratinly better than the both as Endless Sands taps out colourless mana in addition to the other two abilities. If standard had a seat / safety belt, this would be it - perfect plan against targeted removal. 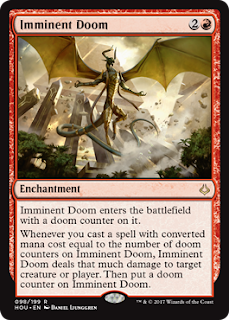 Whenever you cast a spell with converted mana cost equal to the number of doom counters on Imminent Doom, Imminent Doom deals that much damage to target creature or player, then put a doom counter on Imminent Doom. We will nickname this card right now - calling this Enchantment 'Victor', after Marvel supervillian Victor Van Doom. Seems rather progressive but a bit fussy, as you need to play progressively higher CMC spells for this this to deliver. With the Hekma breached and its protection removed, the deserts swept in. Dollar Bin Rare. We cannot imagine a build where players may want this in standard. Were we to pull this out of booster pack, we would likely be inconsolable. When Maw of Chaos enters the battlefield, it deals 3 damage to each other creature. Nice flashy rare with limited board wipe. If by turn 7 (assuming you cannot ramp or cheat this out earlier), you need this spell, things are going rather poorly in your game. 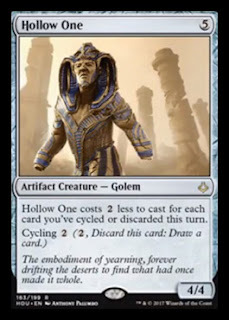 Hollow One costs 2 less to cast for each card you've cycled or discarded this turn. The embodiment of yearning, forever drifting the deserts to find what had once made it whole. Not certain why this thing is pegged ar Rare, as Wizards forgot to add any spice here. That said, this is certainly not abysmal. If you have a list with a good measure of looting (draw / discard), then it may help to a threat on the battlefield while you filter to float out your win condition. 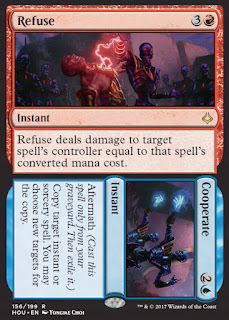 Suggested standard format pairing with Cathartic Reunion (1R sorcery, As an additional cost to cast Cathartic Reunion, discard two cards. Draw three cards.) Makes the Hollow One now cost 1 - Not too shabby. All add a colourless mana and one may pay 1 life, tap to generate the respective coloured mana. Activated abilities as below limted to any time you could play a sorcery. 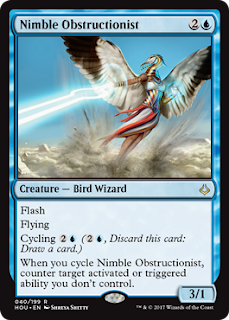 The arts on these do look great, but we really wish the activated abilities here were set at instant speed, which would have made this cycle a lot better. 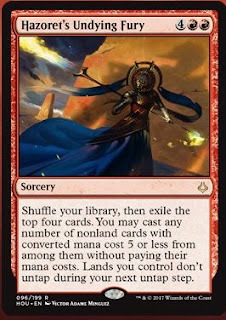 Shefet Dunes - 2WW, sac a desert, creatures you control get +1/+1 until turn's end. Ipnu Rivulet - 1U, sac a desert, mill a player top 4 cards. 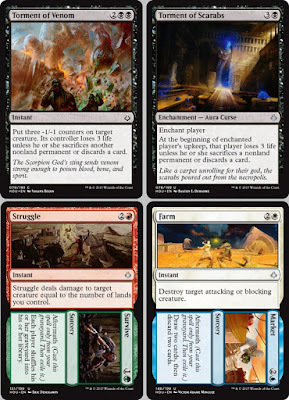 Ifnir Deadlands - 2BB, sac a desert, put 2 -1/-1 counters on target opponent's creature. Ramunap Ruins - 2RR, sac a desert, deal 2 damage to each opponent. 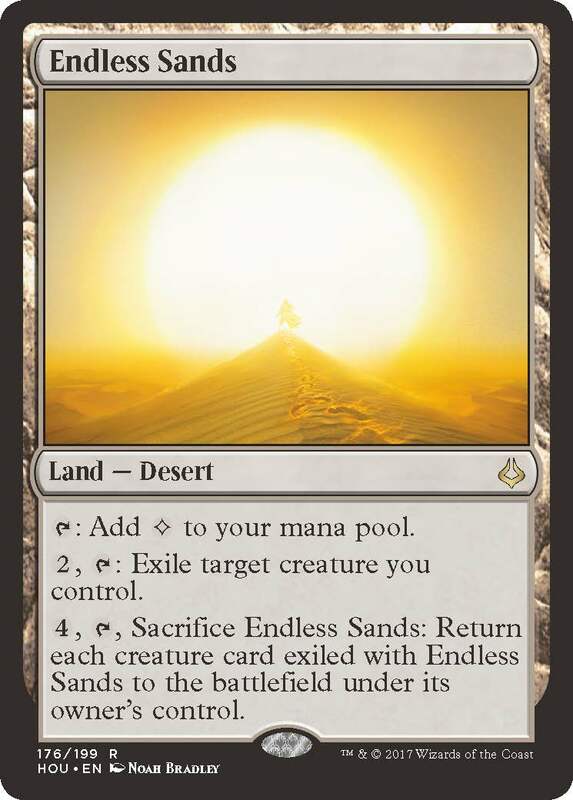 Hashep Oasis - 1GG, sac a desert, targert creature is pumped +3/+3 until turn's end. Here at MTG Realm we've had an average weekend (queue apropos Shadowy Men on a Shadowy Planet track) given the wet and stormy weather. We were rather happy with results during Friday Night Magic - we brought along an Oketra's Monument mono-white tokens decklist, and feel confident enough to develop it to suit our local metagame. We might be playing this list until rotation, and will likely write a Deck Tech for our particular version. The second official week of Magic: the Gathering, Hour of Devastation previews, so we will not banter further but go straight to new cardboard awesomeness. So far, the Hour of Devastation mechanic eternalize was shown to be an activated ability on creature cards. 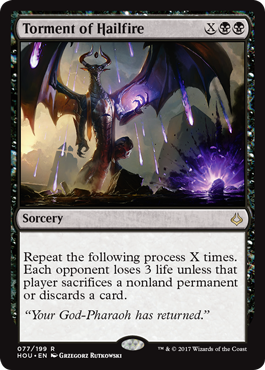 God-Pharaoh's Gift, at a rather hefty cost 7 mana, does not care whether creatures in your graveyard have the eternalize ability. Improving upon sorcery speed, to the beginning of combat means that you could now churn out a hasty 4/4 each turn, so keep those graveyards full and ramp your mana to get the gift as early as you can. 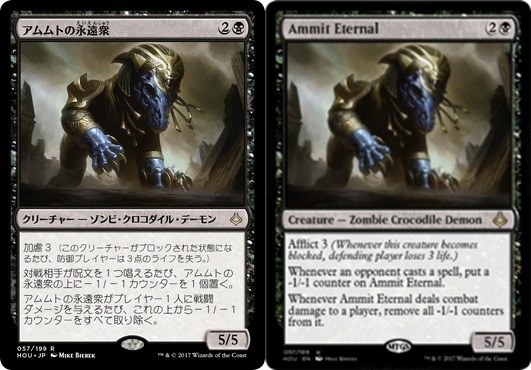 Whenever an opponent casts a spell, put a -1/-1 counter on Ammitt Eternal. Whenever Ammitt Eternal deals combat damage to a player, remove all -1/-1 counters from it. 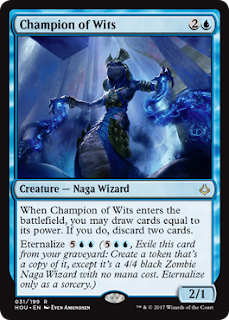 Zombies are a relevant deck in standard and this card may certainly become part of popular lists. For a short time until rotation there is a Grasp of Darkness players can get into their sideboard to put this at -5/-5, after that, this could become a quite a beater. This essentially is Parallectric Feedback with a Twincast, built on the back end. If your opponent does get greedy with an 'X' costed spell, this could not only nerf the spell but feed a lot of damage. Great Izzit spell. We expect that there will be a number of rather happy EDH players out there with this. Perhaps a decent option for blue to filter for that combo piece, control piece or threat, but there is currently several better options available. Give 'em the Bolas Horns ! Pretty Decent finisher. Suggested serving is with Bitterheart Witch in a black and white Orzhov Commander decklist. 1W : Target attacking or blocking zombie gains lifelink until end of turn. 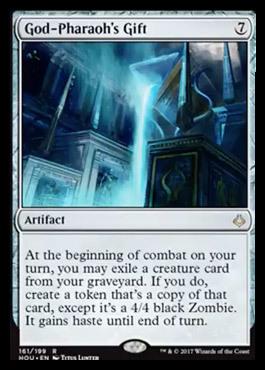 1B : Target attacking or blocking zombie gains deathtouch until end of turn. This may eventually be rolled into a standard Black / White standard zombies list as this provides some interesting combat modifiers. the scarabs poured out of the necropolis. First up - Gathering Magic - Mike Linnemann and Ant Tessitore Preview (link to great podcast right here). Sinuous Striker - 2U 2/2 SNEK Warrior, U to +1/-1 pump, Eternalize 3UU. Not too terrible, and certainly welcome later in the game to bring the nope-rope back into play. 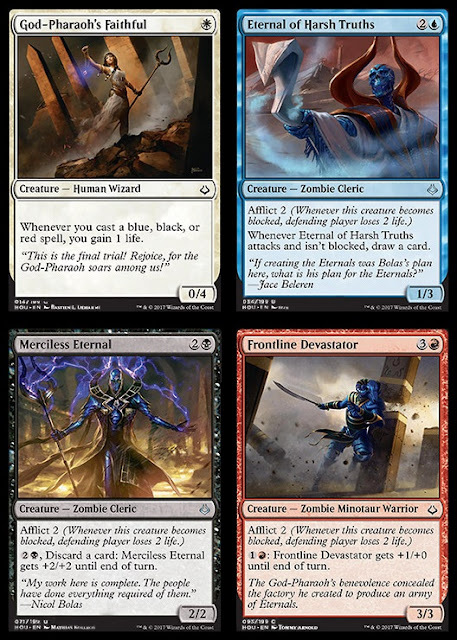 Proven Combatant - U 1/1 human warrior with Eternalize 4UU. Good chump fodder up front, and replay it's zombie mirror late game, if one were to survive turn six. 2U, Flash, flying 3/1 BIRB, cycling 2U - when you cycle this, counter target activated or triggered ability you don't control. A flash flyer with that toughness may lead to a few good combat tricks. Love that this can put out a Planeswalker activation. XBB, Each opponets loses 3 life unless that player sacrifices a non-land permanent or discards a card / repeat 'X' times. 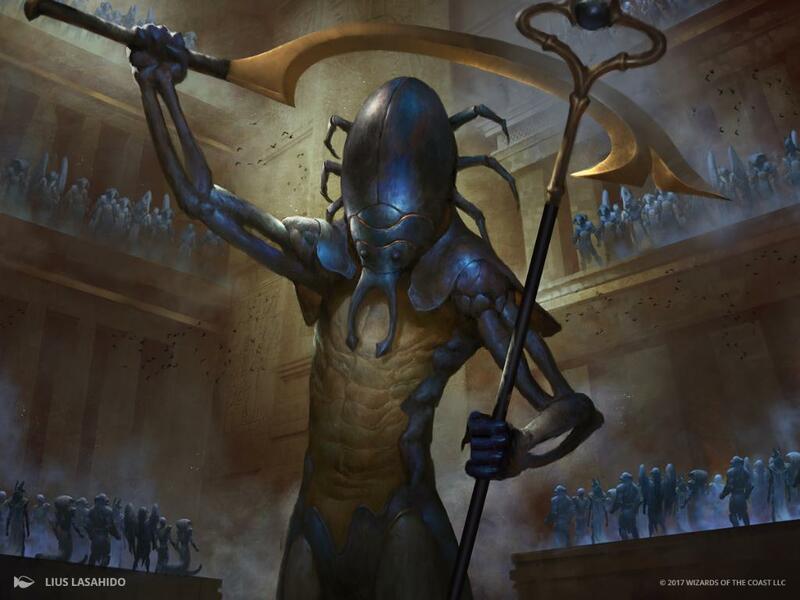 Dman fine finisher in commander and might also see some fringe play in Standard. 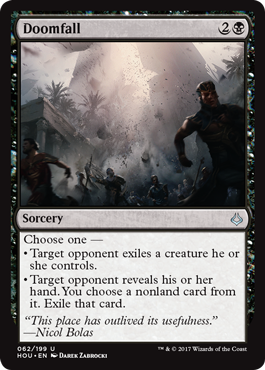 2B sorcery, choice (1) target opponent exiles a creature they control, or (2) target opponent reveals and you choose a nonland card to exile. Flavour text here is delicious. Promises to be a solid choice in a sideboard. Struggle // Survive - 2R Instant with a Ground Assault effect to ping a critter equal to the number of lands you control. Aftermath 1G, plows your yard back into each player's library. Farm // Market - 2W Instant destroy target attacking creature with Aftermath 2U to draw 2 / discard 2. Torment of Scarabs - 3B Curse on an opponent, lose 3 life unlesss they sacrifice a nonland permanent or discards a card. Torment of Venom - 2BB Instant putting 3 -1/-1 counters on target creature, with the owner losing 3 life unless he or she sacrifices another nonland permanent or discards a card.